Reworking tunnels around the system changeover point at Farringdon led to the original Thameslink opening in 1988. Procurement processes to replace the dedicated Class 319 fleet began in April 2008. Stopping services on the southern section of the East Coast Main Line from Peterborough will become part the enlarged Thameslink. A key interchange with Underground, mainline and Eurostar services, the station beneath St Pancras International opened in 2007. The Thameslink Programme will radically increase under the capacity of the core section between St Pancras (pictured) and London Bridge. Active in IEP procurement as part of a consortium, Bombardier has become a leading supplier of UK rolling stock. Supplier of Class 395 Javelins and contracted to upgrade Southeastern Class 465s (pictured), Hitachi may try to extend its UK interests through Thameslink. The transformation works at Blackfriars Railway Bridge were completed in 2012. An interim measure to address high demand on the present Thameslink, two-system Bombardier Class 377 units is being drafted in from other routes. The original Thameslink project led to through passenger trains being introduced on a core route between Bedford and Brighton via central London in 1988. Using the southern end of the Midland Main Line and the classic Brighton line south of Croydon, it was the first substantial service to pass through the capital, as opposed to enforced transfers for travellers between the termini established around the edge of central London by private companies in the mid-19th century. South-east England is the country’s economically dominant region and stations in the London area are the start or finishing point of around 70% of UK rail journeys. "The number of stations within the new Thameslink framework should be around 150." A plan to expand on the runaway success of the initial project by incorporating more lines north and south of the Thames and increase overall capacity was formulated as Thameslink 2000. This title contained the intended opening date, something to become an embarrassing indication of reluctance to fund the scheme and ensuing delay. Rising passenger numbers for leisure travel as well as for commuting has however sustained the pressure to increase rail capacity across the south-east. By mid-2007 the required planning permissions and funding approval had been received for the £6bn project. Now called the Thameslink Programme, the revived scheme is under the direction of British infrastructure operator Network Rail. The scope of the project includes better signalling, new stations, tracks and trains, improvement of existing tracks and longer platforms. The funds will also be used for redeveloping Blackfriars and London Bridge stations and redesigning Farringdon station. The first phase began in October 2007 with a ceremonial start of works at Luton Airport Parkway; one of around 50 stations outside London where platforms needed lengthening by 80m to accommodate 12-coach trains, ending the eight-coach limit. Network Rail completed the extension work at Luton Airport Parkway in December 2008. It is the First Capital Connect-managed station. Platform extension works at Mill Hill Broadway and West Hampstead stations were completed respectively by BCM Rail and Walker Construction. Overall, platforms along the Thameslink route were lengthened by about 4km. The extensions were completed by 2011. The longest extra routes to be incorporated under Thameslink will be those operating from London Kings Cross to the East Coast Main Line station of Peterborough (76 miles/122km) and Kings Lynn (99 miles/159km) via Cambridge. Destinations in southern England likely to be added to the system include Guildford, Eastbourne, Dartford and Ashford. In all, the number of stations within the new Thameslink framework should be around 150. Construction on the second and final phase of the Thameslink programme started in October 2012 with the launch of London Bridge Station redevelopment works. The infrastructure that originally facilitated and remains central to Thameslink is a largely tunnel section from a divergence from the Midland mainline north of St Pancras, through Farringdon to Blackfriars station, where there is access to lines south of the Thames. Replacing Kings Cross Thameslink, the much larger in-tunnel station at St Pancras International opened during 2007. Part of the original service, the short branch to Moorgate in ‘the City’, London’s leading financial district, was closed permanently on 22 March 2009 as part of the modifications needed at junction station Farringdon, an interchange with Transport for London (TfL) Underground. It is also due to become a stop on the new Crossrail line scheduled to open in 2017. Farringdon will retain its significance as the changeover point for trains between the two electrical systems, 25kV overhead to the north, 750V dc third-rail to the south. The share of the project allocated to infrastructure amounts to £3.55bn. The new High Speed 1 (HS1) line is a 108km railway line that slashed journey times from London to Paris, Brussels and Lille when regular services began on 14 November 2007. The most visible infrastructure change, and one that is apparent to non-rail users, is the £350m renewal of Blackfriars station with platforms extending the length of Blackfriars Bridge. This adds an entrance on the south bank of the Thames. Blackfriars TfL Underground station was closed in March 2009. It was closed until late 2011 to facilitate the works, although the mainline station remained open. The new station at Blackfriars is able to handle 12-car trains and have stops for more trains. It became fully operational in summer 2012. Rebuilding of junctions and a new bridge at Borough Market in 2012to reduce the conflict between Charing Cross and Thameslink services were key infrastructure works in terms of increasing throughput. With reference to the 2012 London Olympics, the project provided the capability for 12-coach operation on the Brighton-Bedford section by 2011. Dedicated stock on current Thameslink operations which require 25kV ac and 750V dc capability are four-car Class 319 units delivered 1987-1990. In February 2009, the dual-voltage Bombardier-built Class 377 were redeployed from other lines as an interim measure to add capacity to the present Thameslink operation, because of a delay in manufacturing from Bombardier. A procurement process for a new fleet of multiple unit stock for the future operation was launched in April 2008. Expressions of interest were sought from would-be suppliers which would replace and significantly expand the capacity of the 720 coaches deployed in Class 319 formations on the current Thameslink. 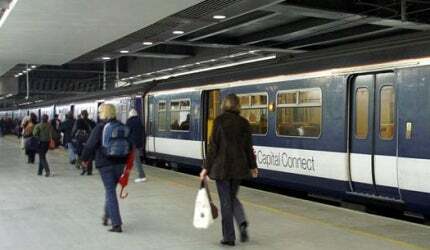 As announced in August 2008, 92 new class 377 carriages are being deployed on First Capital Connect services, this starting in February 2009. The carriages have CCTV and panels to display route information. The services are available between Bedford, London and Brighton and on Southeastern services between St Pancras international, St Albans and Bromley South, Orpington and in the peaks between Ashford and Bedford, Gillingham, Rochester and Bearsted. The number of 319 carriages has also been increased to a total of 23 so that routes are eight cars in length during peak hours, starting from March 2009. The changes, made under a new franchise agreement between the UK Department for Transport and operators Southeastern, First Capital Connect and Southern Railways, will make trains travelling along the Thameslink rail lines 50% longer. The approximately £1.14bn contract for about 1,200 next-generation eight and 12-carriage trains was announced by the Department for Transport in November 2008. The briefs include longer, spacious and more comfortable trains that can provide 14,500 extra seats for passengers. Manufacturers Bombardier, Hitachi, Alstom and Siemens worked on the briefs. Bids for building the trains were formally submitted in 2009 with contracts awarded in March 2010. The first units were made available for mainline testing in late 2011, with batch deliveries entering service between 2012 and 2015. As this procurement overlaps with that for the very large future Intercity Express Programme (IEP) high-speed train, it is probable that the scale of the two orders mean that they would go to different companies or consortia. The contract is expected to include a ten-year maintenance element. Invensys Rail was awarded the contract for resignalling of the Thameslink Programme, in July 2011. Resignalling will be according to systems standard on the constituent lines. The reconstruction and resignalling will enable the throughput of trains on the central section, which will be raised from the present limit of eight per hour to 24 in each direction, an increase needed for the new paths needed to create the Thameslink network. The wider scope and capacity of Thameslink should have the effect of reducing loadings on some mainline services to termini and Transport for London Underground lines. Redirection of Peterborough and Cambridge line trains via tunnels created as part of the St Pancras International High Speed 1 works will also significantly free up capacity at Kings Cross. "The target date for opening the second-generation Thameslink is the end of 2015." The target date for opening the second-generation Thameslink is the end of 2015, when a single franchise for the enlarged system is due to become operational. The current franchise held by the First Group (as First Capital Connect, which also covers affected lines from Kings Cross) expires before the new Thameslink goes live and the future operator is unknown. Before the First Capital Connect name was applied, the previous operating company and the service were both titled Thameslink, the term surviving in common usage and in some station names. It is possible that this could be restored as the operating brand under future franchise arrangements. Consultation is due from 2013 in respect of finalising the exact route structure for the 2015 start of services. By the end of 2015, the frequency of trains to and from central London on the Thameslink route will be every two to three minutes.